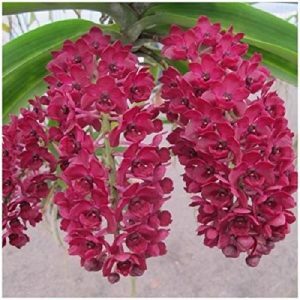 Rhynchostylis (Rhy.) orchids are close relatives to Vanda orchids. The main difference between these related genera is flowers – unlike Vanda, Rhynchostulis orchids have one-lobed lips and usually fragrant. Before re-classification, this genus consisted of 13 species from China, Indochina, Indonesia, Indian Subcontinent, Malaysia and the Philippines, but now there are only four recognized species in this genus of marvelous orchids. Rhynchostylis orchids grow epiphytically in the Asian rainforests on the lower parts of trees, unlike Vanda orchids, which grow on the tops. 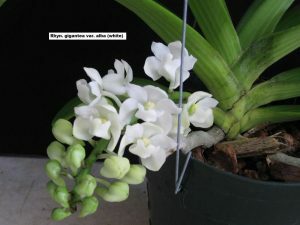 Rhynchostylis orchid has typical Vandaceous habitus – it is a monopodial plant with leathery leaves, which are oppositely arranged, silvery-green roots with thick velamen layer, and flowers, born in racemes. Rhynchostylis retusa is the type species. It has 1 inch wide fragrant (spicy aroma) flowers which are rosy in color, but there are also exceptionally beautiful alba clones. Rhynchostylis coelestis, or Sky-Blue Rhynchostylis has very tender sky-blue flowers, which are 1 inch wide and also fragrant, there are also alba clones, which can be distinguished from Rhynchostylis retusa alba clones by experienced orchid growers and botanists. Rhynchostylis rieferii is a small sized miniature orchid with tiny blue fragrant flowers. 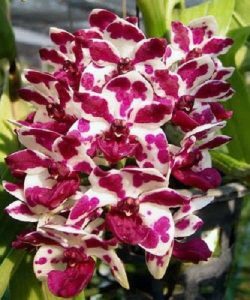 And true collector item Rhynchostylis gigantean, or Giant Rhynchostylis has larger than other Rhynchostylis orchids flowers which are also fragrant, they have pink lips and white petals and sepals with pink markings. There are also alba clones and marvelous violacea variety of this species with solid purple flowers. There are also a lot of beautiful cultivars of this species, for instance, Rhynchostylis gigantea ‘Peach’ with pink-orange flowers, Rhynchostylis gigantea ‘Cartoon’ which flowers are white with rich purple dots and markings, and Rhynchostylis gigantea ‘Cartoon x Plai’. Rhynchostylis orchids growing conditions don’t vary much from Vanda culture, except some things. 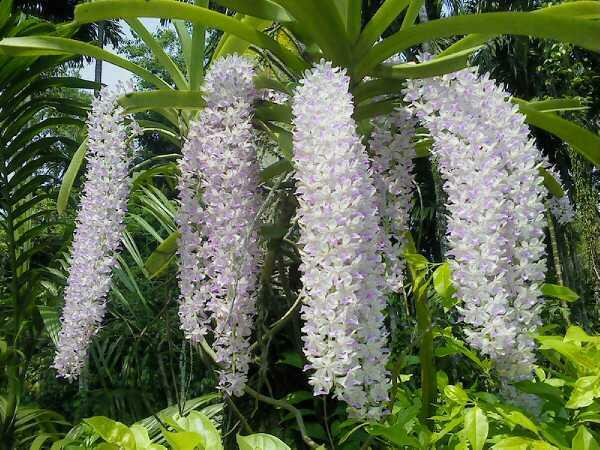 Rhynchostylis orchids grow in shaded areas so they do not tolerate much direct sunlight, unlike Vanda. In fact, they require bright indirect sunlight (something more than for Phalaenopsis but without a direct sun in midday). Unlike blue-flowered Vandas, they are warm to hot growing orchids and don’t tolerate cool temperatures. It is a good idea to grow them bare-rooted without a substrate or in pure large bark in hanging baskets, just like Vanda orchids. They prefer humid air but they can tolerate somewhat dry air. Their roots look like as Vanda ones, but they are actually more tender and fragile, you should water them regularly but allow them to dry between watering, fertilizers should be applied in spring-winter months but not so abundant as for Vanda, because their growth rate is not so fast as Vanda’s. Rhy. gigantea ‘Cartoon’ NEW! Collectors item! Very Fragrant! Foxtail Orchid Plant! Rhy. gigantea ‘Alba’ Selected Large Flower- Fragrant! Foxtail Orchid plant Nice!